nero profumo: CoSTUME NATIONAL Cyber Garden: Brand New Yet Already Obsolete. CoSTUME NATIONAL Cyber Garden: Brand New Yet Already Obsolete. The first time I tried this on a blotter it almost made me cringe. If I weren't so fond of Antoine Lie, I would most definitely have dismissed it right away but I so wanted to like it that I grabbed a couple of samples for further exploration. On skin, it came out being somewhat better. It opens unquestionably mainstream-ish with the usual peppery-citrus combo but an aromatic green floral pattern joins the party right away giving the fragrance a subtle abstract twist. There're violet leaves, hints of minty-geranium and other greens together with a clean musky presence. The fragrance feels transparent and modern but most definitely *not* cyber. Yes, there's something unconventional that might vaguely bring to mind of brand new things, shrink-wrap and vinyl but it's just a hint that, in the end, smells more synthetically modern than futuristic / artsy (as the name of the fragrance would otherwise suggest). the perfumer himself. They wanted an avant twist but at the same time they also wanted to please their mainstream customers. What comes out has some potential but doesn't have enough balls to really stand out. Now, not that I expected super-abstract stuff a-la CDG but I didn't think it would have been so tame either. 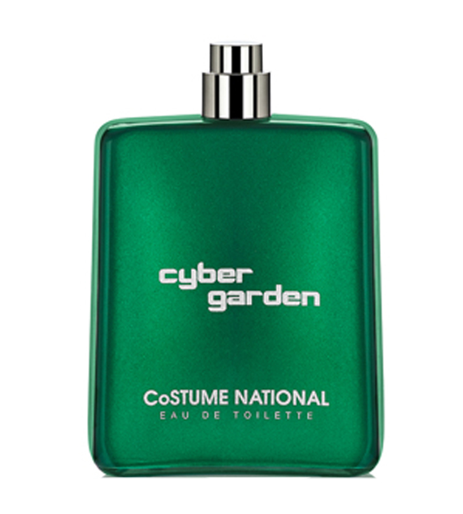 In the end, I think Cyber Garden is a better attempt at delivering a modern green fragrance than, say, Amazingreen but it's really nothing I would go out of my way to get a bottle. I can't honestly say I dislike it but I surely don't like it either. I seriously believe that a bit more of courage would have turned this fragrance into something really interesting. Barely nice and totally forgettable. All about this fragrance is very middle/late 90s. Too much...even the word *cyber* sounds a bit demodè. Despite that, I was still sort of keen towards it because the involvement of Lie but there's nothing to do, it doesn't work for me. There's something I still have to properly point out that ruins it. I tend to believe it's inherent to the texture which unquestionably screams of *designer perfumery*. It's like one of those pop-songs by whatever main pop-artist (could be Gaga, could be Rihanna, could be anyone else). Super compressed, fizzing and super-sparkling trebles and and overall polish which make it feels too anonymous. Not to talk about the packaging which aims at being minimalistic but ends up looking just cheap. Honestly.